Sunlight Mountain Ski Patrol crew members Todd Like and Ron Kroesen boot pack one of the runs on the west side of the ski mountain, in hopes that a weekend storm will allow for more terrain to open. For now, just the Midway run at the bottom of the hill is open for skiing and snowboarding. The rescheduled Day of Infamy snowshoe race that was to take place Sunday at Sunlight Mountain Resort has been cancelled altogether due the lack of snow. 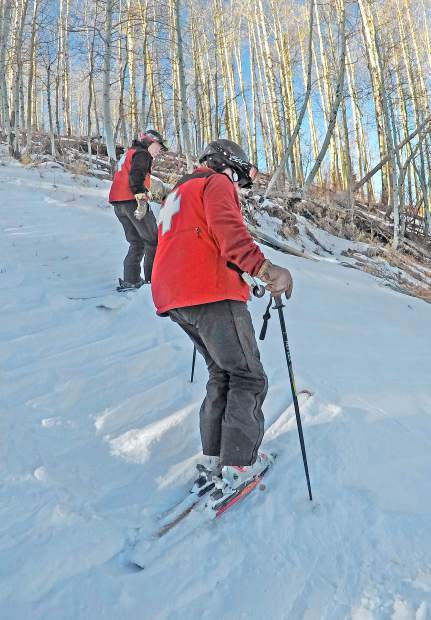 Colorado Animal Rescue, organizers of the race, posted on its Facebook page this week that, without more snow coverage, on the Babbish Gulch trail system, there was too much of a safety concern for racers. Meanwhile, Sunlight’s Skier Appreciation Day is on for Friday. And, for now, the Heathen Challenge scheduled for Jan. 13 is still on. A serious lack of snow to start the season has limited Sunlight Mountain Resort to a single ski run since the area opened Dec. 21. Still, the ski area had a decent holiday stretch and is riding out the snow drought in hopes the weather takes a turn toward the favorable, Sunlight Marketing and Sales Director Troy Hawks said Wednesday. “All in all, the mood here is upbeat considering that it’s a below-average snow year,” Hawks said. “We still saw nice out-of-state visitation over the Christmas holiday, and there were about 250-300 people here [Tuesday], more than we had expected. “And we’re hopeful we can get into a nice storm cycle soon,” he said. That much-needed storm could come as soon as Saturday night and Sunday, when the forecast calls for a reasonable chance of snow. Another storm is in the long-term forecast for the middle of next week. As snowpack moisture content measurements reach levels not seen since the winter drought of 1976-77, though, the outlook is worrisome. Powderhorn Resort, located on the Grand Mesa, announced Wednesday that it is modifying its midweek operating schedule until more snow comes. The area will be closed Monday through Wednesday until further notice, with the exception of Martin Luther King Day on Jan. 15. With its limited terrain, Sunlight hasn’t fully staffed up for the season and has lost some of the workers, mainly lift operators, who had initially signed on for the winter, Hawks said. College students helped to round things out over the holidays, but those workers will soon be leaving as spring semester classes begin, he said. Idled workers have been assigned other duties as needed, he said, and the ski area works with local restaurants to provide gift cards as a way to help them out until more work hours are available. Sunlight normally has about 125 full-time, seasonal employees and a dozen salaried workers. Food and beverage operations still need a certain number of people to keep things going, and the ski school was busy over the holidays giving lessons to about 600 people per day, Hawks said. As it stands, the 33rd annual Skier Appreciation Day is on for Friday. The day features $20 lift tickets, with proceeds benefiting United Way-Battlement to the Bells. There will also be free Sweet Coloradough doughnuts for the first 50 people on the lift, a super hero/villain costume contest for a chance to win a season pass for next year and drawings for limited edition Sunlight 50th anniversary skis and a snowboard. To get ready for the Friday event and the potential for fresh snow over the weekend, Sunlight crews have been busy boot-packing several runs on the west side of the mountain to prepare for a possible opening, Hawks said. A minimum of an additional 8 inches of snow would be needed for that to happen, he said. The potential for a wet, heavy storm would help to build up the snow base. “We’re still analyzing that, though, and certainly remind folks to respect all trail closures on the mountain until we do open new terrain,” Hawks said. The long-term National Weather Service forecast calls for a possible change in the weather pattern next week, with the storm pattern moving southward over the central Rocky Mountains and the Four Corners region.